Pulling up to the house that was transformed into a pizza bar, the first thing you notice is the proper skate ledge poured along the outside. 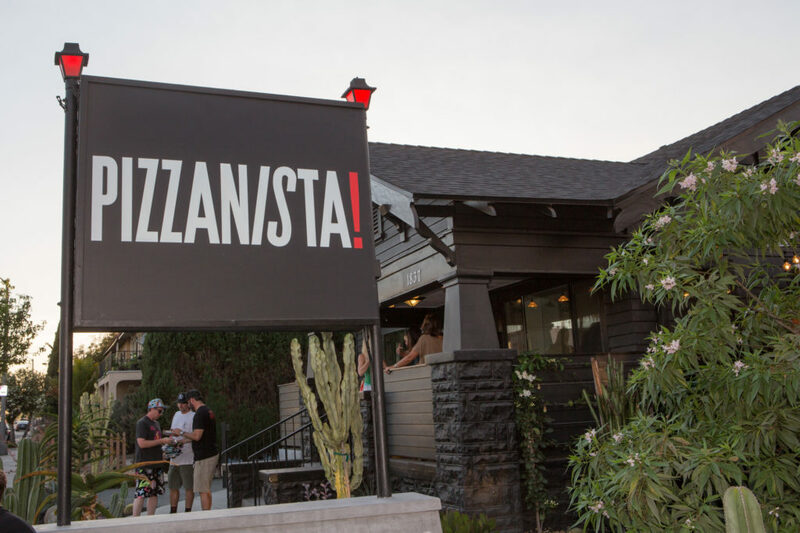 The Dew Tour Partner Welcome Party was hosted at Pizzanista! owned by skateboard legend Salman Agah. 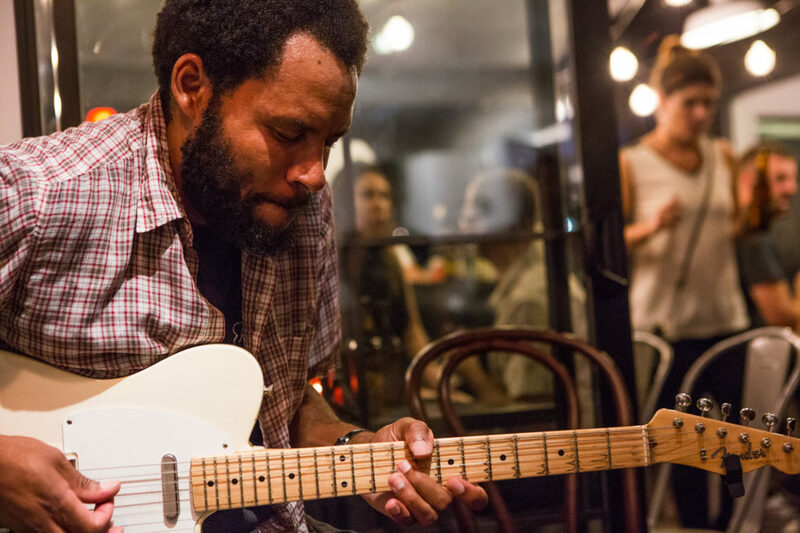 As if that wasn't enough, fellow legend of shred, Ray Barbee was on deck as the musical entertainment for the evening. Everyone was buzzing with excitement. Before entering the building, guests were welcomed with gifts and appetizers. From underwear and socks to gift cards and other pocket-sized goodies, Dew Tour made sure everyone felt like a VIP. Walking into the house, you immediately feel the industrialized vibe that is reminiscent of your favorite brewery, except this place specializes in pizza. 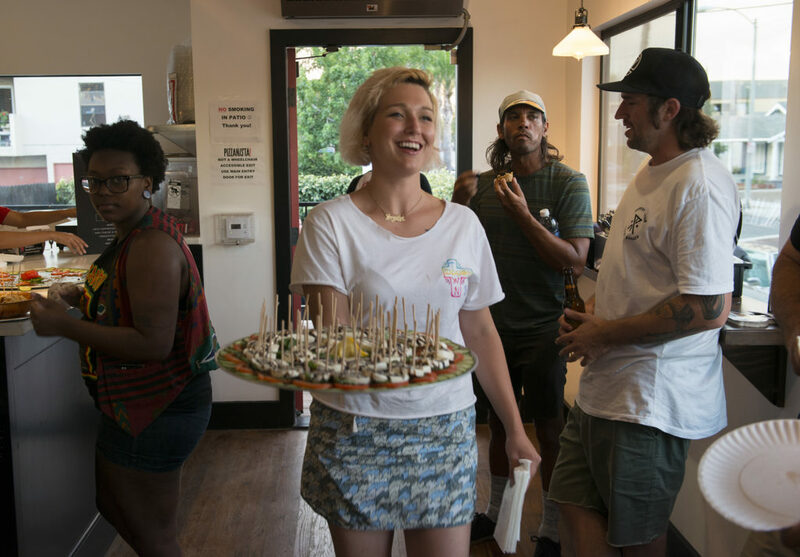 The appetizers offered by the friendly staff ranged from caprese served on toothpick skewers to garlic knots to gourmet meatballs. As you wandered your way through the house turned pizza bar you noticed the window sills were stacked with stickers. This place thought of everything. If you found your way outside there was beer and wine available alongside stained picnic tables lined with more VIP swag, candles, and succulents in mason jars. From the moment you walked up and saw the skate ledge, then snagged your initial appetizers and then proceeded to grab a beer outside, you were sold. Pizzanista! officially became your new favorite pizza bar and you are a VIP. As the evening progressed pizzas were served. Whether you picked the mac & cheese or the meat jesus, every bite was delicious. Sitting at a table outside and examining a slice of meat jesus it was clear to see what toppings were served, for the most part. There was clearly sausage, meatball pepperoni and what looked to be a white onion, but it was actually delicious bacon fat. The pizza was amazing! Closing out the evening was a music set by Barbee. Barbee's music is a smooth mix of funky jazz and classic guitar riffs. As the skateboarders, photographers, friends, business representatives and executives alike gathered, the night became complete and the Dew Tour Partner Welcome Party was a success.